Our puppy class is perfect for puppies who, at the start of the class, are ages 8 weeks through 5 1/2 months, and consists of an online video orientation and 6 weeks of group classes (approximately 45 minutes – 1 hour each week). Classes are held on Wednesday evenings, 7:00 pm, in the SPCA Serving Erie County’s Education Center, 300 Harlem Rd. in West Seneca. This age is when the socialization period is critical. Our program integrates Operation Socialization to help you breeze through this developmental stage with ease. Puppies grow up fast! You want to get started right away on teaching the basics- sit, down, come, settle, stay, leave it, and loose-leash walking. We also will discuss typical puppy behaviors and solutions to house-training, puppy biting, handling, grooming, resource guarding, and appropriate play skills. For puppies who have been adopted from the SPCA Serving Erie County or another rescue agency or shelter, the fee is $100 with a discount code that will be distributed at the time of adoption. For all others, the fee is $130. We do require that, in addition to providing adoption information at the time of registration, you provide proof of adoption and vaccinations at the first class. The earlier you get started, the better! The more time that goes by allows your puppy to practice habits that you may not be fond of. ENROLLMENT FORM, SESSION START DATES, AND ADDITIONAL INFORMATION ARE AVAILABLE HERE! Our Basic Obedience Class is perfect for dogs 6 months and older and consists of an online video orientation and 6 weeks of group classes (approximately 45 minutes each week). Classes are held on Wednesday evenings, 6:00 pm, in the SPCA Serving Erie County’s Education Center, 300 Harlem Rd. in West Seneca. You want to get started right away on teaching the basics: sit, down, come, settle, stay, leave it, loose-leash walking, anti-jumping, wait, and polite greetings. If your pup already has the basics of these skills from a trainer or training class, we will build on these skills, add distractions, and fine-tune their skills. We also will discuss typical problem behaviors and solutions and work on fading out the food rewards. • Work from home, read email, or enjoy a movie uninterrupted! For dogs who have been adopted from the SPCA Serving Erie County or another rescue agency or shelter, the fee is $100 with a discount code that will be distributed at the time of adoption. For all others, the fee is $130. We do require that, in addition to providing adoption information at the time of registration, you provide proof of adoption and vaccinations at the first class. Sit n’ Stay Pet Services, Inc. 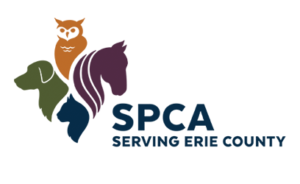 The training programs recommended by the SPCA practice similar training philosophies (positive reinforcement training) as the SPCA Serving Erie County. Recommended area trainers are available here, but PLEASE NOTE: the SPCA Serving Erie County encourages pet owners to educate themselves on the benefits of positive reinforcement training and the adverse effects of punishment-based training. The adverse effects of punishment-based training can include risk of injury to you and your pet, and the potential for negative, possibly permanent damage to your pet’s mental and emotional health. Be sure to interview trainers and ask what methods they use before deciding who is right for you and your pet. The SPCA strongly recommends attending and observing a class prior to registration. For more information, please see this statement by the American Veterinary Society of Animal Behavior.